The Arizona Wildcats played the Oregon Ducks on Saturday night in Eugene, following allegations that FBI wiretaps intercepted phone conversations between Arizona head coach Sean Miller and Christian Hawkins, an associate of ASM Sports agent Andy Miller. Miller and Hawkins reportedly discussed paying elite recruit Deandre Ayton $100,000 to ensure the center would commit to Arizona. Miller did not coach the Wildcats on Saturday night (and he may never coach them again), but — in a controversial decision — Arizona announced on Saturday that Ayton will be eligible to play for the rest of the season. So, you knew that Ayton — the projected top pick in the upcoming NBA Draft — would hear it from the Oregon fans at Matthew Knight Arena. Not only did Oregon fans boo Ayton, but they went all-out with their signage as well. There was also a “U of Pay” sign, and some dude apparently wore a black sportcoat with “FBI” in green. Oregon students being told via dry erase board to not reveal signs until game time (probably so they won't get confiscated). 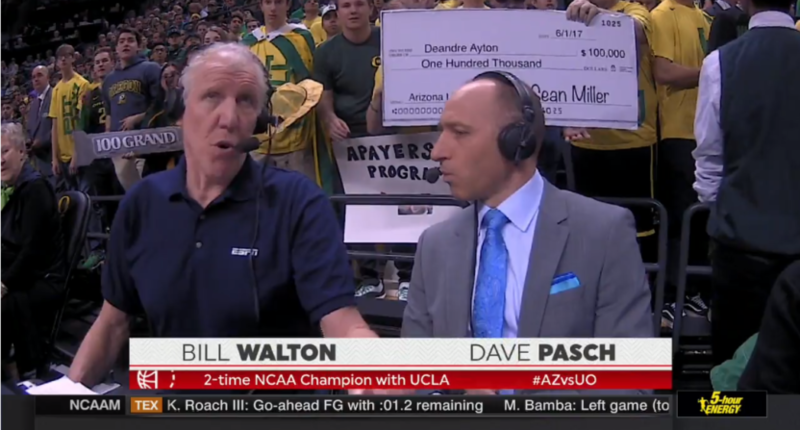 One has a "100 Grand" bar, one a check to Deandre Ayton and of course there's a U of Pay sign. One guy is wearing a black sportcoat w FBI taped in green. The trolling throughout the night certainly didn’t hurt Ayton’s production. Ayton had 28 points (11-of-15 FG, 4-4 FT), 16 rebounds, four blocks, and a nasty dunk. However, Oregon came away victorious in overtime, 98-93.